Throughout my time in Florence thus far, I have experienced a little bit of every kind of weather including sunshine, rain, sleet, and even snow for the first time in years. 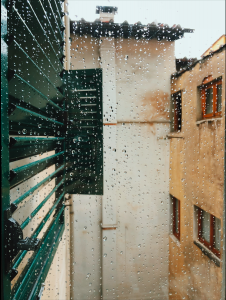 Dealing with the amount of rain and strange weather we have had here lately can be frustrating if your plans include things like going to the beautiful Piazzale Michelangelo, walking along the river, or visiting the stunning Boboli Gardens. But I’ve learned that no rainy day in Florence should stop you from exploring the city because there are tons of things you can do that don’t require being outside and getting soaked. The obvious answer to what you can do in Florence when it rains is, of course, go museum hopping. Although, if you are a few months into your program, chances are you’ve already hit all the big ones like the Ufizzi and Galleria dell’Accademia, and may be looking to see something a little different. 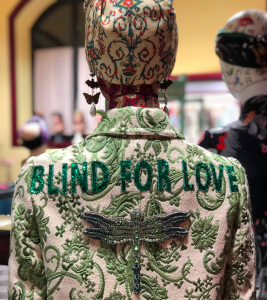 A really fun place for young people, especially if you like fashion, is the Gucci Gardens museum. It has all kinds of vintage and modern Gucci clothing and accessories, creative exhibits, and the best part is that it is free for students! Another exhibition that one may not think to go to is The Monet Experience. Florence is known for its rich history in Renaissance art, but on a rainy day I stumbled upon this temporary exhibition revolved around Monet and other Impressionist artists, and it was AMAZING. First of all, you are able to put on 3D virtual reality glasses that completely immerse you inside of his paintings. One minute you are in a field engaging with his iconic Woman with a Parasol, the next you are standing on a bridge overlooking his iconic Water Lilies, but this is not even the best part. 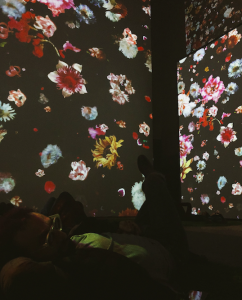 My favorite part of this exhibit involved a room with projectors displaying artwork all over the walls and ceilings while beautiful music is playing, but it gets better. The floor has heated grass pads that everyone lays on and relaxes while they take in all the art around them. We were in there for over an hour and completely lost track of time; it was incredible. Unfortunately this is only a temporary exhibit, so if you are in Florence, get there soon before it is gone! 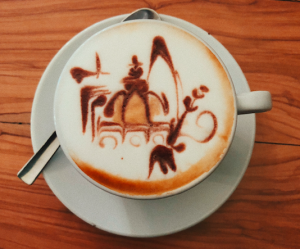 Most often on a rainy day I make my way to one of Florence’s many cool coffee shops. One of my favorites is News Cafe, which is a great relaxed and cozy spot for doing homework. The owner’s dog, Gordo, usually hangs around and will come sit by you, and the best part is the artwork they do on their cappuccinos. One time they even put the Duomo on mine! These are only a few of the many things that can keep you busy on a rainy day in Florence, but quite honestly I don’t think you could ever run out of things to do here! We all have that one friend that could put on any outfit and still look amazing, and I’ve learned that Florence is the kind of city that can take on any kind of weather and still be amazing too. Erin is a spring 2018 SAI Florence student from the College of Charleston.